Find answers to commonly asked questions related to catering and entertainment. Why are catering invoices now going through Marketplace? Prior to January 1, 2017, catering services that required a contract were initiated in Marketplace as a requisition, but were reconciled in MyEvents to obtain the approvals required by entertainment policy. This process involved, to a degree, a duplication of efforts in two different systems. When a caterer or bar service provider performs services on UC San Diego property, there is risk of illness or injury. To mitigate the university’s risk, a purchase order using the Catering Services iRequest should be processed in Marketplace. To eliminate the need for a secondary system to process the payment, entertainment policy workflow from MyEvents was replicated in Marketplace. This allows a single catering order, requiring a contract, to be initiated and approved in one system. This reduces the need for campus users to provide the same information twice and allows caterers and bar service providers to send invoices directly to Marketplace. Why did MyEvents integrate with MyPayments? MyPayments and MyEvents are similar tools that were built around two different policies. Rather than maintain two separate tools that function similarly, they were integrated by building the entertainment policy workflow, formerly managed in MyEvents, into MyPayments. MyPayments was built on newer technology that allows for a better user experience. It also utilizes the Business Unit Management Tool (BUMT) replacing IFIS entertainment approval templates. When do I use Marketplace and when do I use MyPayments? Marketplace should be used when a caterer or bar service provider is coming on UC San Diego property to perform services. This can include but is not limited to serving food or beverages, cooking on site, or setting up and serving from an ice cream cart. When a Purchase Order is issued through Marketplace, there is no need for a signature on the supplier’s quote. If the supplier is requesting a signed contract, email the document to HospitalityContracts@ucsd.edu. MyPayments should be used when there is no liability involved with the food or beverages being served at the event. This can include food being delivered (not served), light snacks and beverages being purchased at a market, going to a restaurant, or ordering from a catering menu and going to pick it up. Note: Hospitality Agreements should be routed through HospitalityContracts@ucsd.edu and payment processed via MyPayments. You can also read more about Hospitality Agreements here. When can I use my Travel Card? Use your Travel Card for meetings or entertainment that do not require a catering contract. Such examples include meals at restaurants, purchasing cookies at a market, pizza delivery, or take-out. Using your Travel Card allows payment to be made at the time the goods are purchased, eliminates the need to have the payee submit a paper invoice, and can be easily reconciled within MyPayments. Remember: Purchases $75 or more require a receipt attached to the MyPayments document. Do not use your Travel Card to pay for any orders processed in Marketplace. 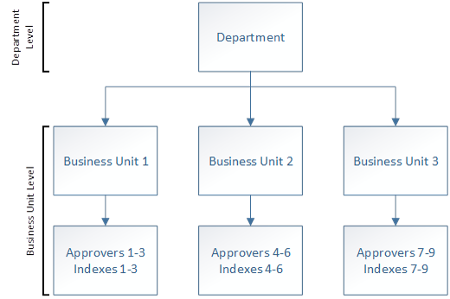 How do entertainment hierarchies work in the BUMT compared to IFIS templates? IFIS approval templates were structured based on the preparer they were created for. The approvers on a preparer’s template approved any documents submitted by that specific preparer, and a preparer could not submit a document unless they had a template created specifically for them. In addition, a preparer might have multiple templates created for different situations. The BUMT allows approvers to be assigned at the department or business unit level versus the preparer level. Entertainment approvers are assigned at the department level, which means any document submitted by any preparer on fund sources within a department will route to the entertainment approvers for that department. How do I add an entertainment approver to the BUMT? Contact your BUMT Administrator for your department to review the entertainment approvers currently assigned to your department. If a new entertainment approver needs to be added, review the following guidelines on who can approve at the different entertainment levels, and make sure this approver has the appropriate delegation of authority on file. Note: If the delegation of authority of an entertainment approver needs to be canceled, contact your BUMT Administrator as they have the ability to remove approvers. How do I find an Agreement caterer? A list of Campus Agreement Caterers and bar service providers can be found on Blink, along with any discounts available to UC San Diego. 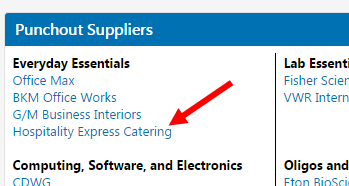 How do I find the punchout for Hospitality Express? What if I want to use a caterer who does not have an agreement with UC San Diego? If your caterer/bar service provider does not have an agreement with UC San Diego, you can confirm that they are set up in Marketplace using the Supplier Search Tool. If your caterer/bar service provider is not in Marketplace, request that they register here. How does a caterer become an Agreement Supplier? Verify that the caterer/bar service provider is already setup in Marketplace using the Supplier Search Tool. If your caterer/bar service provider is not in Marketplace, request that they register. Once the caterer or bar service provider is registered, send an email to HospitalityContracts@ucsd.edu to request the supplier be setup as a new Campus Agreement Caterer. If appropriate, the caterer/bar service provider will receive an official invitation and application to become a Campus Agreement Caterer. Once the supplier agrees to UC’s standard terms and conditions and provides the required documentation, an agreement will be signed and the agreement status will be reflected in their profile. 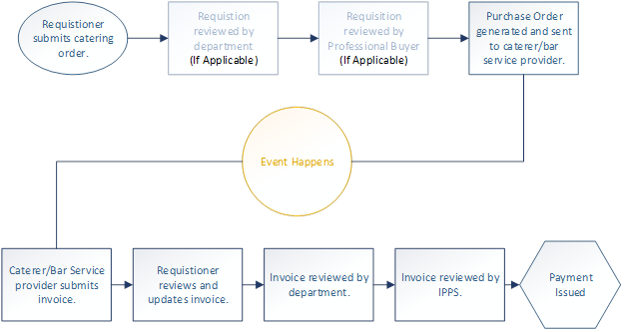 What is the lifecycle of a catering purchase order and invoice? How do I fill out the Catering iRequest? Follow these steps for completing the catering iRequest. Which account code do I use for catering or bar services? Use for nontaxable food, labor, delivery charges, etc. Use for taxable food, labor, delivery charges, etc. Use for the purchase of alcoholic beverages. Note: Account code 638143 – RECHARGE is only for catering orders placed with Hospitality Express. Why does my catering requisition keep getting returned? The Official Host was not selected for a ‘Hosted’ event. The fund source is not allowed due to the purchase of alcoholic beverages or the cost per person exceeds the allowable maximum. The Business Unit Approver or a Professional Buyer returned the requisition to you. How do I add the Official Host to the requisition? Follow these steps for adding an Official Host to your requisition when the order is for a ‘Hosted’ event. Where should invoices be sent for a catering purchase order? Agreement caterers have been provided with a link to Transcepta’s website to send invoices directly to UC San Diego: http://connect.transcepta.com/ucsd. Non-Agreement caterers should send their invoice to Disbursements to the address listed on the Purchase Order. All invoices need to clearly reference the Purchase Order number. If you are contacted by a caterer that has a past-due invoice, submit the invoice through ASK. Primary Category: Invoices, Bills and Payments and Sub-Category: PO Related Payments (Invoices). Note: Do not use ASK to send current invoices. Encourage the caterer to register with Transcepta. Also, do not attach invoices to requisitions or purchase orders. Send them through ASK as indicated above. How do I request a deposit for a Marketplace catering order? Note: The deposit amount must be less than 50% of the total anticipated costs, and the invoice number should be different than the final invoice. The invoice will route for any necessary approvals, and will be flagged for the Travel & Entertainment team as a deposit request. You can track the status of the deposit by reviewing the Approvals tab on the Marketplace Invoice. How do I review a catering invoice as the requisitioner? Follow these steps for reviewing a catering invoice as the requisitioner. How do I approve a catering invoice? Follow these steps for approving a catering invoice as an entertainment approver. How do I request missing information from the requisitioner? Follow these steps for communicating with the requisitioner on the invoice or requisition. How do I attach the attendee list to the invoice? 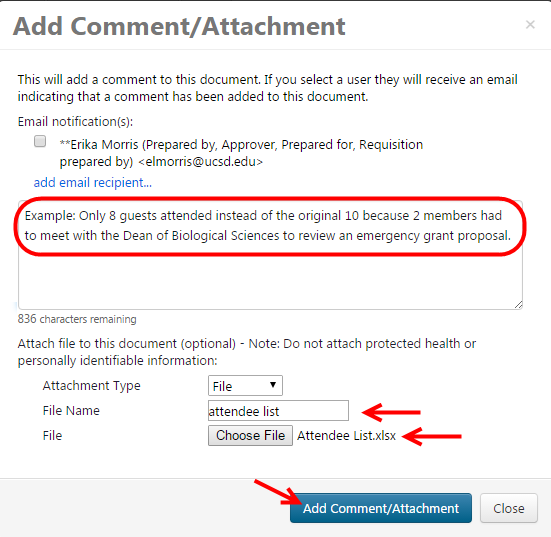 Follow these steps to attach the attendee list using the Add Comments/Attachments tab on the invoice document. When attaching your attendee list, make sure it includes the name, titles, and affiliations of the attendees. Note: A participant list is not typically required for Programmatic events: Extending, Sponsoring, and Providing. Instead, provide a comment with a detailed description of who the attendees were. How do I create an 'Event' in MyPayments? What is an Event Group? 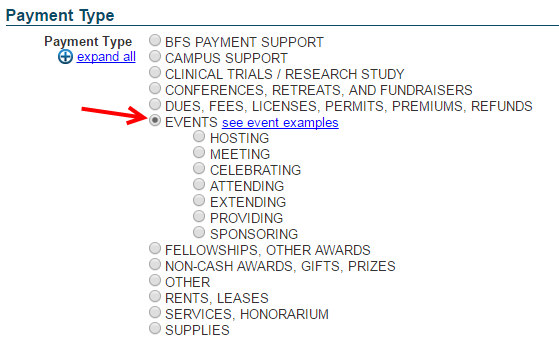 An event group is an attendee list that you can create, store, and use for your Events created within MyPayments. 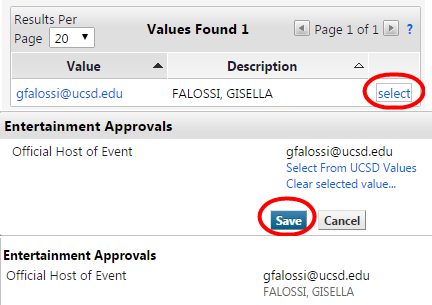 Event Groups can be used repeatedly instead of attaching a file or manually typing the same or similar list of attendees for different events, and can be shared with other UC San Diego employees. Remember when using Events Groups: Departments are required to provide accurate final participants and be mindful of the frequency policy. 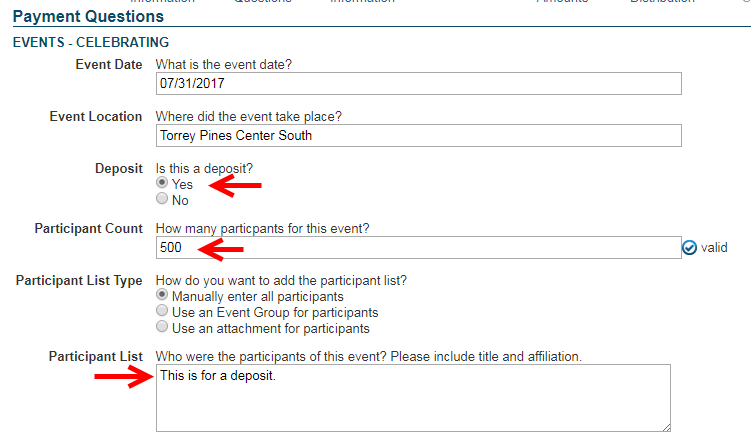 How do I create an Event Group? How do I request a Travel Card payment for an event in MyPayments? After you have started an Event within MyPayments, you will be asked to indicate a payment method. To request a payment to someone’s Travel Card, select ‘Direct Payment to UCSD Travel Card’. Note: The payee must have an active UC San Diego Travel Card on file. If the payee does not have an active card on file, the system will prompt you to select a different payee or change the payment method. How do I request a deposit for an EVENTS in MyPayments? 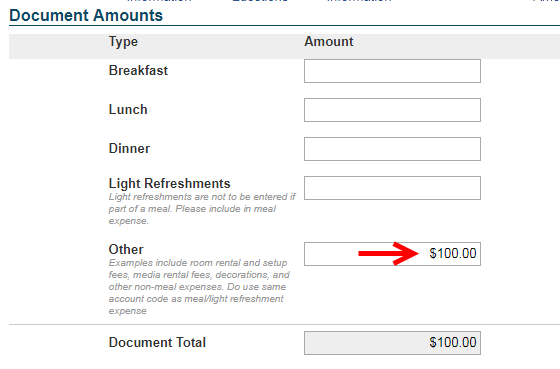 When providing the amount, enter the deposit amount as Other. Note: The deposit amount should be less than 50% of the total anticipated costs. The deposit request will route for any necessary approvals. You can track the status of your deposit by reviewing the document in your Pending Documents queue. How do I access historical MyEvents documents?